During October Miles Wine Cellars is happy to help raise funds and awareness to the New York Wine Industry Association (NYWIA) during their Year of Giving campaign. The New York Wine Industry Association (NYWIA) is a not-for-profit organization founded in 2009. It consists of passionate grape growers, winery owners and allied suppliers in New York State. 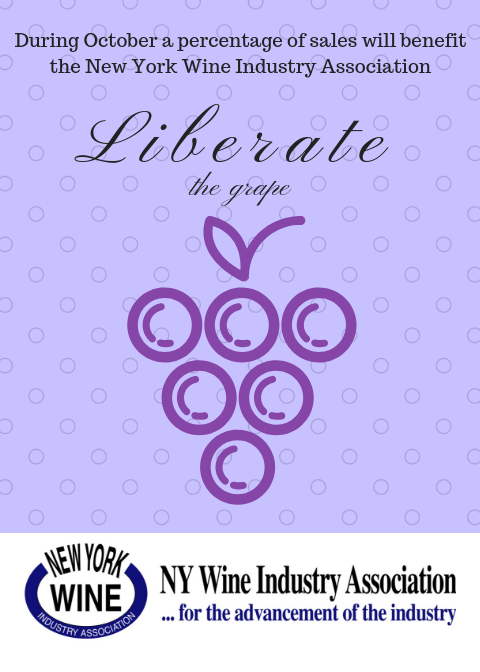 Their motto “Liberate the Grape” emphasis their goal to promote industry improvement and the NYWIA makes every effort to blaze a trail with crucial activities. Throughout its brief presence, NYWIA has succeeded in uniting some of the most popular figures of the New York wine and grape growing market. Among our primary focuses is to provide members with information and tools that will permit them to make educated choices and enlightened choices that will help them grow their companies and eventually advance the industry. NYWIA serves as a watchdog and lobbies on behalf of members. The association carefully monitors legal arguments and activity, not just in Albany, however across the country. NYWIA and its executive board members have actually created efficient relationships with key New York legislators and state firms’ agents. During its brief existence, NYWIA has placed itself as a voice for the New York wine industry and successfully defeated legislation damaging to consumer choice and New York’s farm-beverage based neighborhood. In the month of October, a portion of the sales from Miles Wine Cellars and wineries statewide will be donated to NYWIA. So buy New York state wines!